This category recognizes stormwater practices that were installed prior to 2010 but have been exceptionally maintained such that the still perform the stormwater quality and quantity functions they were designed for, but also an asset to the neighborhood or community at large. Evidence that the BMP has been inspected in the last three years and passed with flying colors with respect to its water quality and flood control functions. Is a place you would be happy to live or work next to. Below you will find information about the winner of the Best Maintained BMP category for the 2017 BUBBAs. Built in 2003, this exceptionally-maintained hybrid BMP combines the benefits of a stream daylighting project, a wet pond with forebay, and the surrounding restored riparian habitat. The UVA Landscape Department conducts routine, sometimes daily, inspections to remove trash, identify and remove invasive species, and manage geese populations. 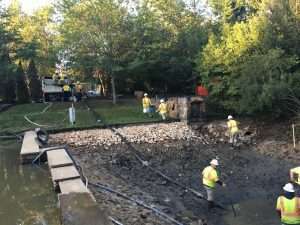 The Utilities Department is responsible for maintaining the sediment control structures, and has performed two cleanings of the forebay during the BMP’s thirteen-year life. To read a full project narrative and view more photos, please visit the project folder on the Google Drive.